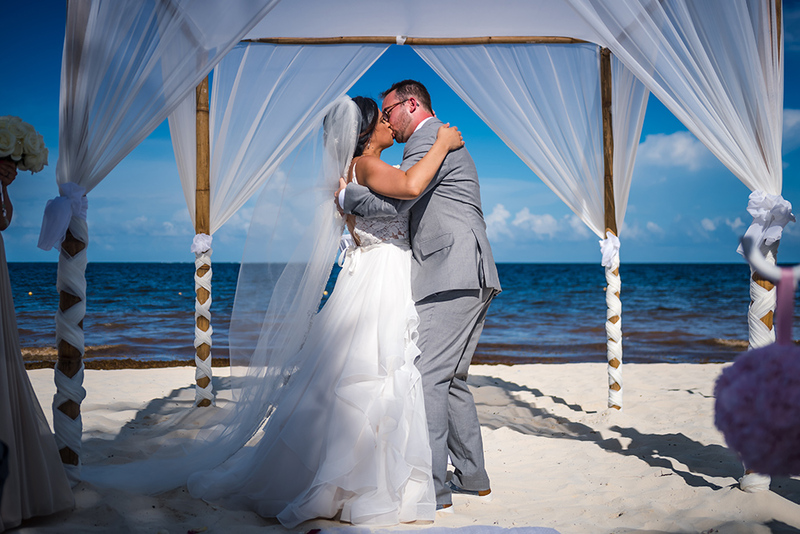 On a sunny afternoon, it was time to meet Larissa and Jonathan at the Royalton Riviera Cancun Resort & Spa. 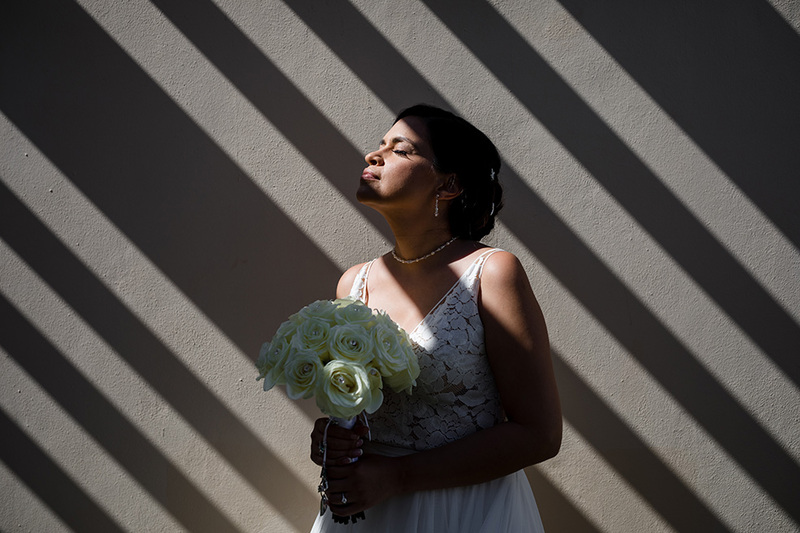 Their big romance day had come, and Larissa was Getting Ready in her suite, in the company of her family, Maid of Honor Liz and the lovely bridesmaids. Honestly, she looked stunning in her elegant white wedding gown. Once she put on the veil, it was as if she had just left a fairy tale, and despite the hot late summer day, she was radiant. 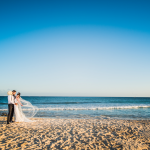 While Larissa was having her first photo shoot of the day, Jonathan had been starting to approach the beach ceremony location, together with his family, Best Man Mark, and groomsmen, and guests were being seated near the wedding aisle, accompanied by the relaxing sound of an acoustic guitar. At 4:00 pm begun the Bridal Party Processional to the classical sound of Pachelbel’s “Canon in D”, followed by the Bridal Entrance to “Ave Maria”. Finally, the bridal couple was standing together in front of the altar, and Minister Luis started with the wedding ceremony. 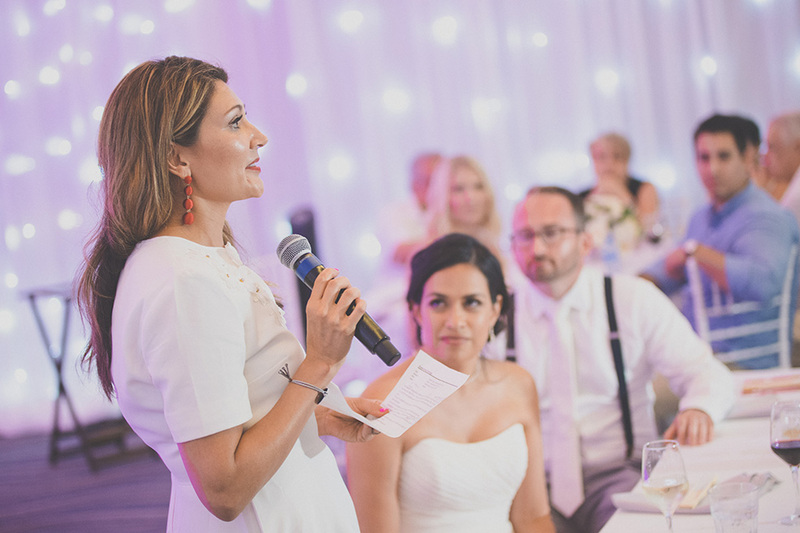 After his first message about love and marriage, Larissa and Jonathan exchanged the wedding vows and the rings, promising each other with shining eyes their future loyalty, love, trust, and support. Minister Luis then continued his speech and at last declared them “Husband and Wife”, leading to The BIG moment of any wedding ceremony: THE KISS. This moment was crowned by the Mariachis coming in and playing the happy “La Bamba” song, leading afterward the Recessional to a cocktail at the Poolside Terrace. 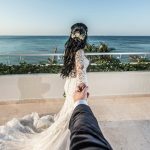 While guests started having fun at the cocktail, the family and bridal party were still expressing their joy at a photo and video session on the beach, and after chilling out a bit at the cocktail, the bridal couple had another photo shoot around the resort, highlighting their romance. At 6.30 pm guests were seated at the resort’s Ballroom and a 5-min video was shown, in which you could see both the bride’s and groom’s childhoods and backgrounds, first individually and then as a couple, and you could not just see, but also feel that they are made for each other. What was standing out here was the fact that Larissa is a proud breast cancer survivor, which makes her not only a survivor but also a warrior and gives women all around the world a message of courage and hope, because it reminds us all that hard times can make you even stronger, and that the best is yet to come! After the entrances of the newlyweds, the meal was blessed by Jonathan’s father Jim and the whole party enjoyed their dinner for around an hour. It was finally time for the toasts of Best Man Mark and Maid of Honor Liz, both depicting in their very own words the groom and bride and their best wishes, leading to some tears of laughter on the one side and some of pure emotion on the other. Now, what is a wedding without its cake? Of course, they still had to cut the cake and enjoy their first bites of it before their First Dance to Kane Brown’s “Heaven”, followed by the dances with their parents. 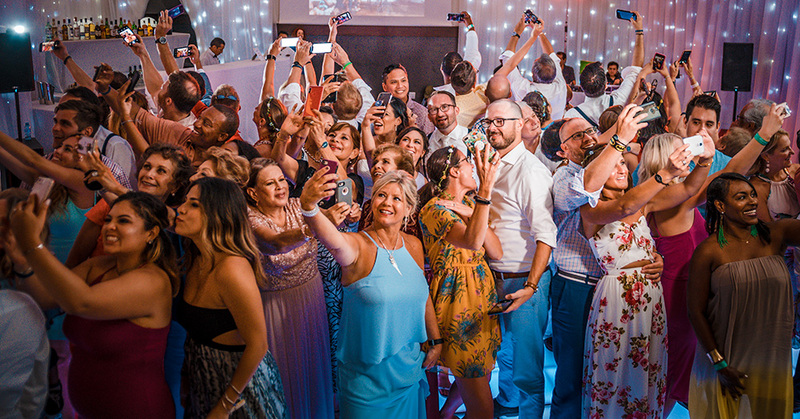 Then the Master of Ceremonies invited everybody to a huge “group selfie” on the dance floor and got the party started, with a great mix of different hits from many decades. And that was just the beginning of the feast, because one hour later “Hora Loca” started, where all guests and hotel staff received funny party items such as hats and other funky accessories. Really, I love to disguise and we all had a blast dancing around, enjoying life and love! The party continued for another one and a half hour, leading to a moment of magic when bubbles were handed out to everybody, filling the entire ballroom with an aura of glitter and lightness. In such a shiny atmosphere, dancing came to an end with a very meaningful song: “Don’t Stop Believin’” by Journey, giving the entire day and night the perfect rounding off. And I can say, after a day full of excitement, our passionate Romanza photo- and videography team was glad to witness not only a day of love but also of hope.